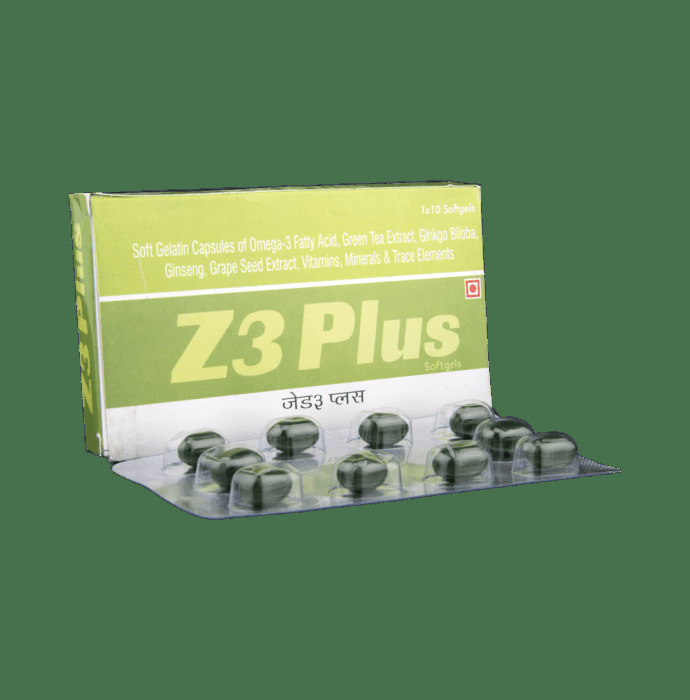 Z3 Plus Capsules contains Omega - 3 Fatty Acids, Ginkgo Biloba, Ginseng, Grape Seed Extract, Vitamins, Minerals and Trace Elements. Omega 3 Fatty Acids help in lowering triglyceride levels and increase high density lipids in blood. Ginkgo Biloba boosts muscle growth by increasing muscle mass and strength. It also increases blood flow. Ginseng boosts the energy levels of the body, lowers blood sugar, relieves stress, relaxes the body, controls blood sugar, and promotes good sexual health. Grape Seed Extract is helpful for fatigue muscles, toning the skin, in acne and for oily skin. It also has antimicrobial action. Vitamins prevents cell damage, regulates tissue and cell growth and increases immunity. Minerals help in body functions and are important for body processes to run smoothly. Trace elements are part of our body's enzymes, hormones and cells. They help in smooth functioning of all this vital body components. 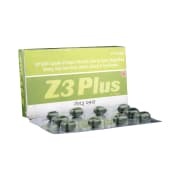 Z3 Plus Capsules are used for providing essential nutrients to body to maintain vital health wellness. Take Z3 Plus Capsule orally. A licensed pharmacy from your nearest location will deliver Z3 Plus Soft Gelatin Capsule. Once the pharmacy accepts your order, the details of the pharmacy will be shared with you. Acceptance of your order is based on the validity of your prescription and the availability of this medicine.